Summary of the project: I spent a month in Recife developing a campaign to remind people that some of life's most important lessons are in the stories we read as children. Nazia works as a planner at Ogilvy in London. She runs a bit of the agency called Cultural Strategy, which is all about using cultural anthropology to understand people’s lives better. 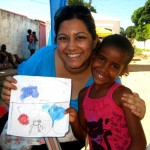 Nazia was a TIE volunteer in early 2011 and found the experience 'deeply special'. She'd never been to Brazil before, so was keen to throw herself into a whole new cultural experience. She grew up in Bangladesh and believes that the best kind of development is the kind that delivers and leaves skills, rather than taking away local jobs. That’s why volunteering her skills appealed so much.